About 20km west of Kohima is the idyllic village of Khonoma, home to the famed Angami Nagas of war-lore, and equally fiercely famous as protectors of the soil and its avifauna inhabitants. The love that the Angami Nagas hold for their lands is legendary. Having lived off the bounty of Dzukou for ages, their relationship with the valley is so intimate that they would rather lay down their lives than let outsiders set foot on their soil. So, nearly two centuries ago, when British forces invaded the land, they were sent packing. Not once, but several times. Indeed, the Angami men of the region have gone down in history for their famed martial skills and prowess in battle; though this traditional career in warfare has since been replaced by vocations guided by the land and resources available to them. The paddy fields of Khonoma are a spectacular sight during the harvest season, with stunning hues of green swaying to the winds. 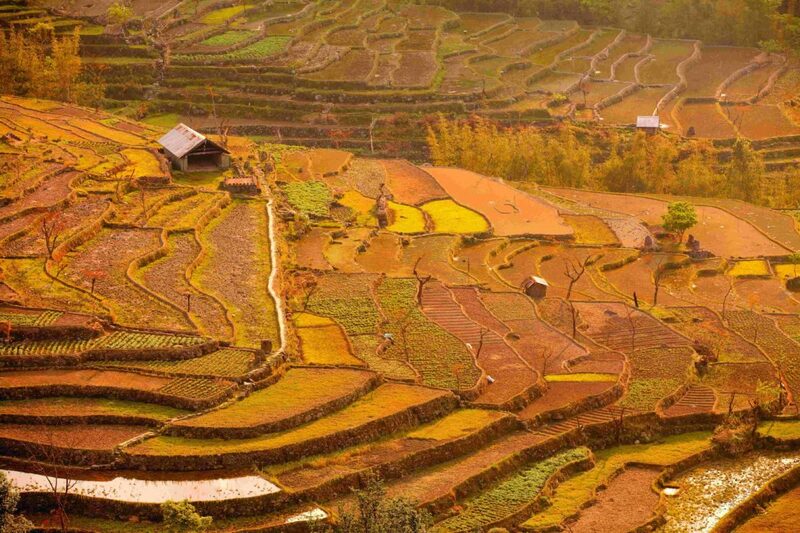 These terraced fields are known to grow over 40 types of paddy at different elevations. Members of this warrior tribe have always been fiercely protective of their environs; in the early 90s, when logging and hunting threatened to wipe out the nearby forests, the village elders, notably Tsilie Sakhrie, rose to the occasion. Hunting, which was practised extensively across the region was decisively banned, while the forests around were declared as the Khonoma Nature Conservation and Tragopan Sanctuary (1998). It is due to this foresight that, today, the woods are alive with the cries and calls of wildlife that is regaining its numbers once again. Protection and conservation of the Blyth’s Tragopan (Tragopan blythii), the State Bird of Nagaland was also initiated by the community. The sanctuary adjoins the Japfu mountain range and is designated as an Important Bird Area (IBA). Besides the Tragopan, it shelters many other rare and endangered avifauna species. This is even more significant considering that wildlife hunting is a way of life with Naga tribes. That the community collectively decided to ban hunting exercises in the entire village, and not only the sanctuary, speaks volumes about how far it has travelled since its headhunting days. 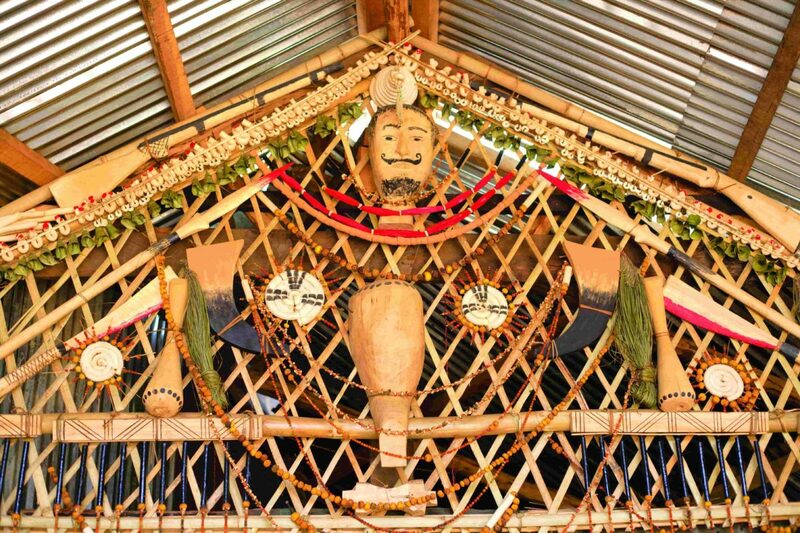 Religious totems adorn the entrance of a traditional morung or public house in Khonoma. These morungs are like a modern day coffee house or school. They were centres of learning during the pre-Christian era. As if to live up to its reputation of being difficult to conquer, the road to Khonoma is a battle in itself. The hour-long ride from Kohima rattles every muscle and bone in your body, but at the end, as if to compensate for the gruelling journey, the road opens up to splendid views of wood and stone houses hugging the mountain slopes. In 2003, the Khonoma Tourism Development Board was constituted to encourage local men and women of the village to work as tourist guides, tour operators and interpreters. In the same year, the Union Ministry of Tourism and Culture adopted Khonoma under its Green Village Project, making way for a circular road and solar lights. This postcard village is interconnected by a maze of stone pathways and dirt tracks, making it an absolute walker’s paradise. The morning after my arrival, I set out to explore the tiny alleys. Tsilie, my enthusiastic guide, led us to our first stop, at the craftsman Angulie’s workshop. Angulie has won a national award for his skills in weaving an array of bamboo products. At 62, his eyesight is still strong and he spends most of the day crafting intricate designs. We followed this up with a visit to a family of handloom weavers, who make lovely shawls and jackets. 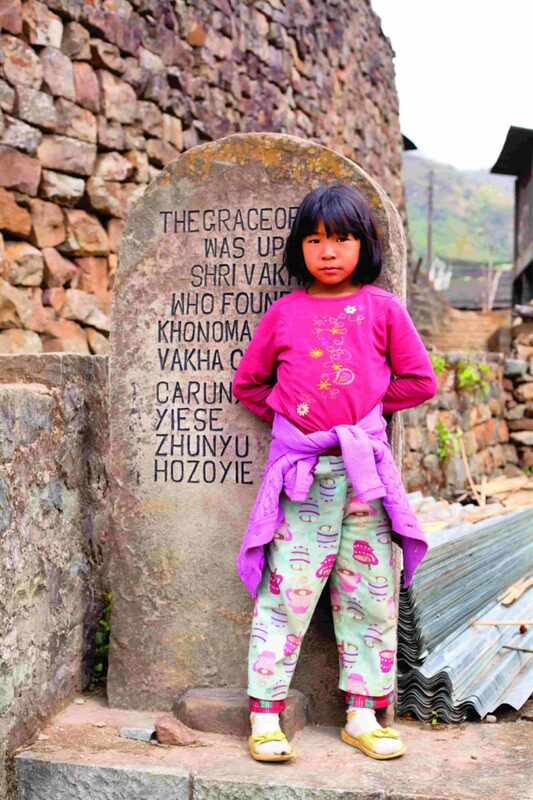 Nagaland is home to 16 (officially-recognised) tribes, each of them having distinct vocations, livelihoods and skills. Finally, we climbed up to the old Semoma Fort— scene of the last battle between the British and the tribes—which offers spectacular views of the terraced fields and the surrounding forests. Khonoma is known to have the oldest cultivation in the region and is famous for producing around 60 different varieties of rice. In fact, the village is well-known in agricultural circles for its sophisticated shifting cultivation; where farmers use Nepal alder (Alnus nepalensis) trees interspersed with the crops. These trees return nitrogen to the soil, thereby helping the land regain fertility when farmers abandon it to move on to the next plot. If you happen to be here during harvest season, be sure to get your hands dirty in the fields. It’s quite an experience. Hunting, though banned, has always been second nature to the Nagas. In the past few years, there’s been increased pressure from within the community to open up the forests for hunting. So after much deliberation, the elders now allow hunting for a week during the annual traditional festival. Development, on the other hand, has brought about a renewed strain on the forest resources. These have changed the conservation dynamics to an extent, but at a time when greed has taken precedence over age-old cultures and traditions, the natives of Khonoma are leading bravely by example. Today, they are an inspiration for forest communities all across the country; a testimony to the fact that modern ideas of progress can go hand-in-hand with nature conservation and self-sustenance both. Cover Photo: This beautiful church is located just before the village, and is definitely worth a visit. Christianity was introduced in the valley by American missionaries. Mayank Soni is a photographer and filmmaker based in Mumbai. His work focuses mainly on travel, culture and environment conservation. His love for the outdoors and indigenous cultures has led him to explore a range of remote corners across India. He regularly contributes to Lonely Planet Magazine India, National Geographic Traveller Magazine India and Conde Nast Traveller India.